Here’s a review of the 2017 Samsung Gear VR (SM-R325), and how it differs from the 2016 Gear VR (SM-R324 and yes, there are a few differences) and Google Daydream. Also: which is better for the Gear VR: a Samsung S8 or S8+? Not counting Google Cardboard, Samsung Gear VR is the most popular VR headset, with over 5 million users as of January 2017. 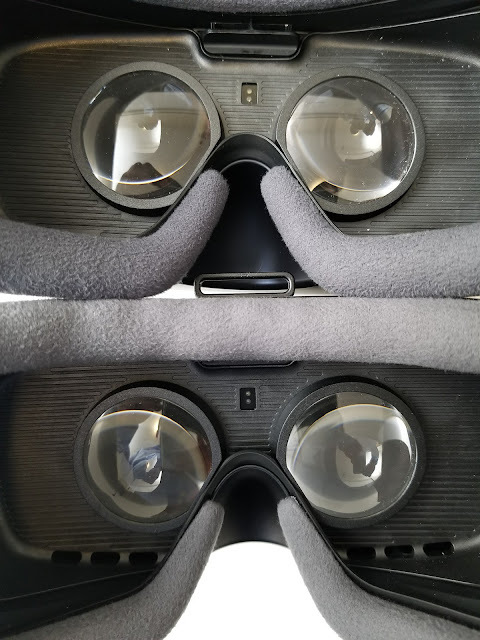 If you haven’t tried it, it’s easy to dismiss it as an overpriced cardboard headset, but you would be mistaken — it’s totally different, and the experience is much closer to desktop VR than Google Cardboard. The 2017 Gear VR is not much different from the original Gear VR in terms of its immersiveness, so I’ll refer you to my original Gear VR review here. Instead, this post will focus on the differences between the 2017 Gear VR and the 2016 Gear VR as well as Google Cardboard. The back button is raised, while the home button is recessed, so it’s fairly easy to tell which button you’re pressing while wearing the Gear VR. The motion controller can track rotational movement (pitch, yaw, roll) very accurately but it can’t track positional movement (forward / backward, upward / downward, or lateral movement). In actual use, it feels somewhat like using a mouse in the sense that it doesn’t track your movement 1:1, but feels very responsive and you can control it easily to make precise movements such as hitting the bullseye on targets (with the help of a virtual laser pointer). I never noticed any lag in the motion controls. It felt more accurate and responsive than what I recall from the motion controller of Google Daydream. The motion controller makes games much more fun. There are games such as Drop Dead that can be controlled with either the touchpad, gamepad, or the motion controller. There’s a huge difference with being able to use the motion controller, even if the motion controller only tracks rotational movement. It feels much more intuitive, and the game feels more immersive. 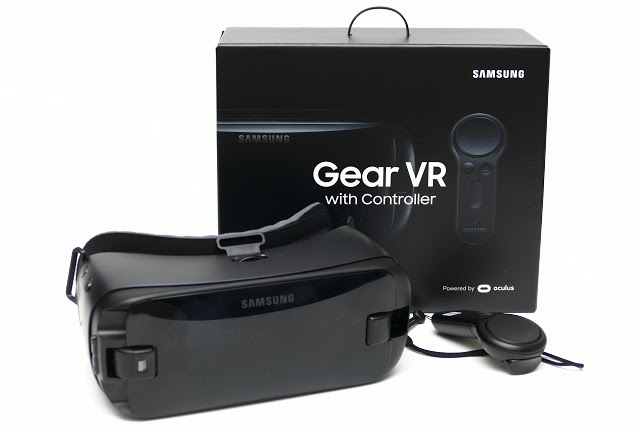 The motion controller is available for purchase separately for existing Gear VR owners. I tried the motion controller on a Samsung S6 with the 2016 Gear VR and it worked just as well as it did on a Samsung S8+ with 2017 Gear VR. 1. Thinner Type C adapter to fit the S8+. The 2017 Gear VR includes a thinner adapter that allows the S8+ to be inserted fully into the Gear VR. If you attach the S8+ to a 2016 Gear VR, it can work but it will be very hard to fit, and the S8+’s left edge will be slightly lifted. 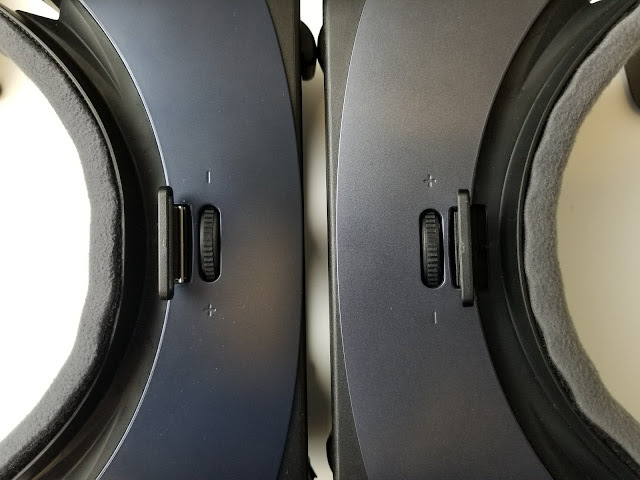 The difference in fit is not due to a difference between the 2016 and 2017 Gear VR per se, but simply because of the thinner adapter from the 2017 Gear VR. If you use the thinner 2017 Gear VR adapter on the 2016 Gear VR, the S8+ will work just as well on the 2016. 2. The 2017 Gear VR may be more comfortable for some people. The 2017’s face cushion is thinner and leaves more space for the nose bridge. Whereas the 2016 Gear VR pinched my nose slightly, I didn’t feel any such discomfort from pinching with the 2017. There are a couple of cosmetic differences between the 2016 and 2017 Gear VR. The 2017 is gunmetal gray while the 2016 is gunmetal blue. Also, the 2017 has a glossy cover, while the 2016 cover has a matte finish. The addition of a motion controller to the Gear VR seems to have been an idea copied from the Google Daydream, which featured a motion controller at launch. I don’t have Daydream (yet) but I’ve demo’d it a few times (my first hands-on impressions here). – Daydream feels more comfortable because of its soft fabric exterior and its noticeably lighter weight. – Daydream’s face cushion is removable and washable. – I also like how Daydream’s controller can be stored in the headset. – Has a native YouTube app. Earlier this week, Google announced that this summer, Samsung S8 and S8+ will become Daydream-compatible. The differences between Gear VR and Daydream would therefore be moot, at least for owners of S8 and S8+ (and future Samsung phones), unless for some reason they can only have one of the headsets. The S8+ is longer than the S8 but when the S8+ is used with the Gear VR, I did not notice any increase in field of view I compared the field of view of the S8+ and the S6. In fact, the S8 plus has slightly more SDE than the S6 (because the S8+ has a slightly lower 529 PPI than the S6’s 577 PPI). The motion controller on the 2017 Samsung Gear VR works very well and adds a lot of value to games that support it. There aren’t so many games yet with motion controller support, but this will likely increase over time. If you’re new to Gear VR, the 2017 is a no-brainer (over the 2016 or older Gear VR headsets), and in my opinion, it’s better than Google Daydream. Dead and Buried (free with motion controller) – a fantasy / Western shooter based on the eponymous Oculus Rift game. Nice graphics, but quite challenging. I still like it a lot. Drop Dead – an action shooter (if you liked games like House of the Dead, you’ll love this.). Motion controls are perfect for this awesome shooter (one of my all-time favorite games for the Gear VR). Esper 2 – use your telekinetic powers to manipulate objects to solve puzzles. The addition of motion controls makes this game much more intuitive. If you know you want a Gear VR but you are choosing between getting a Samsung S8 or S8+, either one is fine – the S8+’s larger screen won’t make a difference. The benefit of the S8+ over the S8 when using the Gear VR would be the larger battery capacity. 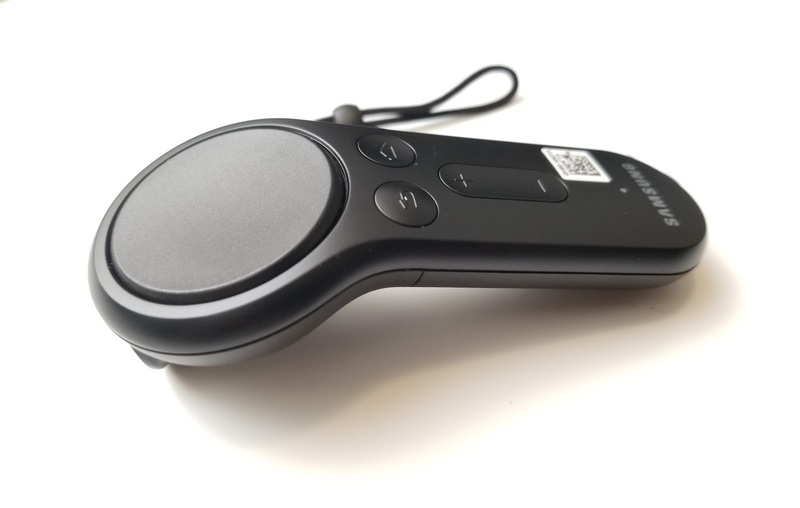 2017 Gear VR controller by itself: Amazon or eBay. 2017 Gear VR Type C adapter by itself (to fit the Samsung S8+): eBay. Thank you very much for using the links above to support 360 Rumors at no additional cost to you so I can do more reviews and tests for you! Hi Michael, could you confirm if the S8 can fit the old Gear VR 2016 without changing to a thinner Type C adapter from your ebay link? Hi James. 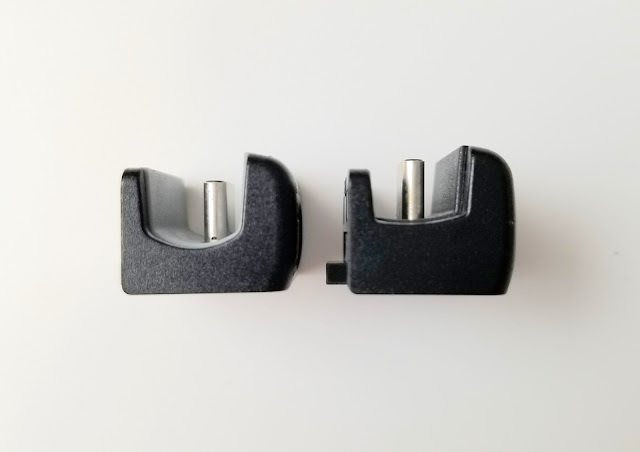 If you literally mean S8, then yes as long as your Gear VR has the type C adapter (move the connector to position A). If you mean S8+, then it will be a very tight fit, and it won’t be fully seated. Hi Michael, thanks for the reply. After searching the forums, I realized I have the 2015 white version of Gear VR which is totally not compatible with the new S8 phone even if I convert to type C it won’t work. It’s ok I still have the Note 5 that is compatible with the old gear VR.